What is Alibaba Cloud WAF? Alibaba Cloud WAF and Anti-DDoS Pro and are fully compatible. You can use the following architecture to deploy WAF and Anti-DDoS Pro together: Anti-DDoS Pro (entry layer, DDoS attack protection) > WAF (intermediate layer, web attack protection) > Origin. 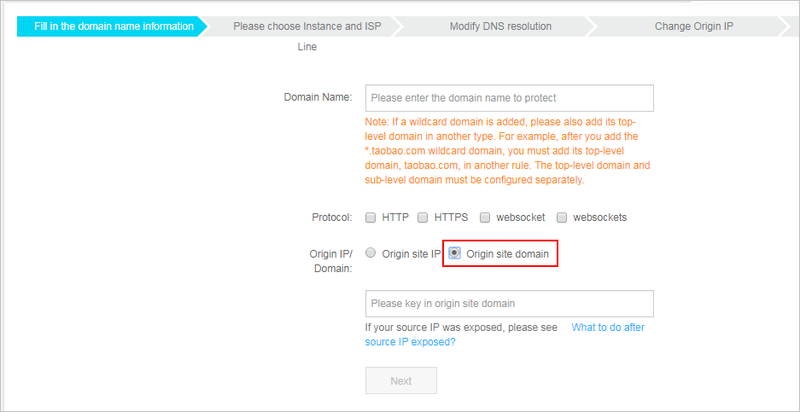 Create a website configuration for your website in Alibaba Cloud WAF. Server address: Check IP and enter the public IP address of the ECS instance/Server Load Balancer instance or external server IP address. Any layer 7 proxy (e.g. Anti-DDoS/CDN) enabled? : Check yes. For more information, see Website configuration. On the Access > Web Service page, click Add Domain. Domain name: Enter the domain name to be protected. Protocol: Check the supported protocol. Origin IP/Domain: Check Origin site domain and enter the WAF CNAME address. Note For more information about how to view the WAF CNAME address, see WAF deployment guide. Complete the Please choose Instance and ISP Line task. Update the DNS settings of your domain name. Log on to the DNS host's system and add a CNAME record to redirect web traffic to the Anti-DDoS Pro CNAME address. For more information, see Access Anti-DDoS Pro through a CNAME record. All web requests to your website are redirected to Anti-DDoS Pro for cleanup and then redirected to WAF for inspection before they reach your origin server.